The greatest of cities all seem to have their own, signature art museum. New York is home to the Museum of Modern Art. London touts the Tate Modern. Paris has the Centre Pompidou. 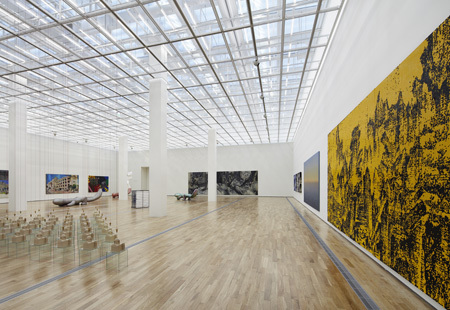 It remains to be seen whether the brand new Museum of Modern and Contemporary Art (MMCA) Seoul, which after years of anticipation was unveiled to the public on Wednesday, will ever be thrown in the discussion of the world’s leading art institutions. With that said, the museum does set an inspiring first impression with its massive, ultra-modern architecture and the cutting-edge creations that fills it. The museum ― a product of a four-year, 246 billion won (about $230 million) investment ― is located between Gyeongbok Palace and the Samcheong-dong leisure district in central Seoul. It is a branch of MMCA’s main institution in Gwacheon, Gyeonggi Province, but a branch of flagship status. Displayed in “The Aleph Project” section, Philip Beesley’s “Epiphyte Chamber” visualizes the human nerve system. The structure reacts to the viewer’s movement. Nearly 4,000 people visited the museum on the first day alone and the lines are expected to be excruciatingly long in the next several weeks. The museum expects to sell 2 million tickets a year. The museum does appear to deliver on the hefty expectations with a memorable collection of Korean and international contemporary art. 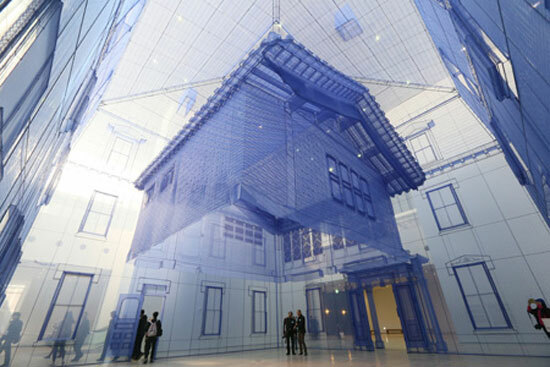 The first thing visitors will see after entering the hall is a blue, fabric house suspended in mid-air. The work, dubbed ”Home within Home within Home within Home within Home,’’ is a creation of Suh Do-ho and epitomizes the creative process involved in designing the museum’s building. The museum was built on the site of a colonial era military venue and was an attempt at marrying cutting-edge architecture with tradition. The modern main hall, designed by Mihn Hyun-jun, blends convincingly with the preserved old Defense Security Command building dating back to the 1930s and a late Joseon Kingdom (1392-1910) period structure, which is also part of the complex. Yang Min-ha’s “Intervention, Misalignment” recaptures the history of the MMCA and how the Seoul branch was conceived. In ”Home,’’ Suh smartly comments on the museum’s unique cohesion between the architectural styles of different eras by borrowing from his personal memories. His work combines five different elements ― the ”Korean House,’’ or Suh’s childhood ”hanok’’ (traditional Korean house) home, a ”Western House,’’ a life-sized clone of the house Suh lived in the United States, Seoul Box, the display space of the new museum where the work is hung, the MMCA Seoul building, and a mini version of Seoul City. Suh’s attention to detail is stunning. He managed to re-create every brick of his old American home and the delicate, lattice patterns of the doors of his childhood home. 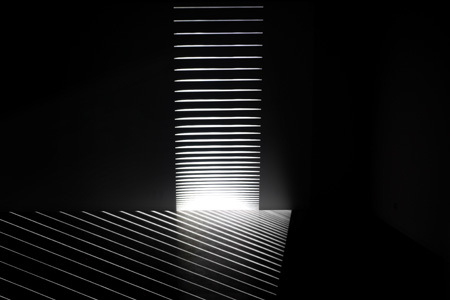 Suh’s work can come off as overwhelming, so Choe U-ram’s mischievous ”Opertus Lunula Umbra,’’ which means ”hidden shadow’’ in Latin, is a welcome complement. Choe says the swirling work of metal portrays how he imagines the balance and interaction between the sun, moon, water and wind. 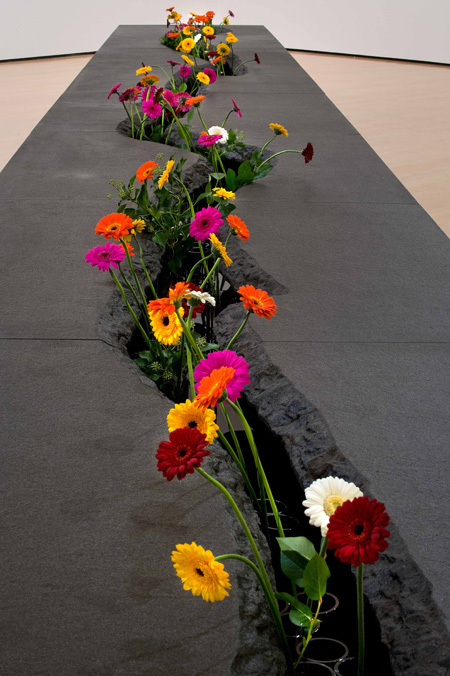 Lee Mingwei’s “The Moving Garden” consists of real flowers and visitors are allowed to pick them if they are willing to share their personal stories. The museum’s main exhibition, titled ”Connecting-Unfolding,’’ hints at its future direction. Seven different curators were involved in the project ― Choi Eun-ju, chief curator of the MMCA; Richard Flood of the New Museum of Contemporary Art, New York; Ann Gallagher from the Tate in London; Yuko Hasegawa from New Museum of Contemporary Art Tokyo; Lee Sook-kyung from the Tate Research Centre Asia-Pacific; Bernhard Serexhe from Center for Art and Media Karlsruhe, Germany; and Pooja Sood from Khoj International Artists’ Association, India. Most of the works displayed here are large and striking in their expression. If the new museum is to have any shortcomings, it will be attributable to audacity, not timidity. American artist Kim Jone’s ”War Drawing’’ and ”Mudman Structure with Bucket and Boot’’ is a commentary on the brutality of war. Kishio Suga rearranged his 1973 work ”Izonsa’’ to portray the interdependence and communication between people in a complicated world. Swiss artist Marc Lee throws together images and sounds of different cities around the world in ”10,000 Moving Cities-Same but Different.’’ It is an interactive piece that allows visitors to choose the city they wish to be projected on the while cubic structures that work as screens. The “Zeitgeist Korea” exhibit looks back on the definitive works of Korean modern art. 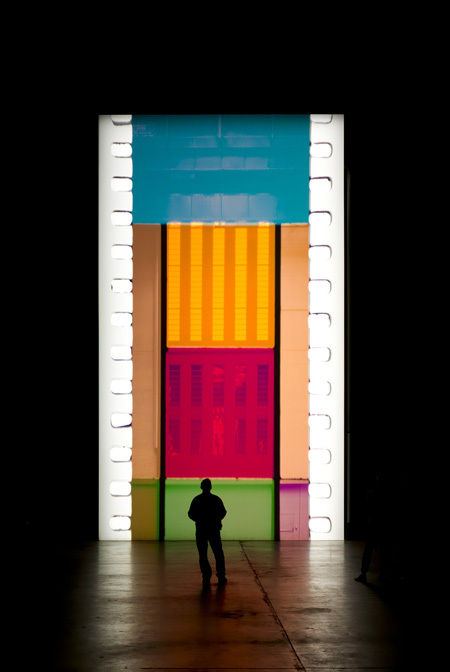 Tacita Dean’s ”Film’’ is a soundless motion picture beamed through an old-fashion projector, featuring different patterns of shapes and colors that aren’t tied to a unified narrative. Amar Kanwar’s ”The Sovereign Forest’’ is a multimedia work on the social and political issues shaping India. Lee Mingwei’s ”Moving Garden’’ is a literally a work in progress. It is consisted of real flowers, which are refilled every morning. Visitors are allowed to pick them if they are willing to share their personal stories. His other work, ”Sonic Blossom,’’ was inspired by his ailing mother. This is also an interactive piece – vocalists will walk around the museum and sing Schubert to random visitors. Yang Min-ha is the only Korean artist whose work is represented in ”Connecting-Unfolding.’’ In ”Intervention, Misalignment,’’ he recaptures the process of the MMCA and now the Seoul branch was conceived. The museum’s more experimental, interdisciplinary side is shown in the exhibit ”The Aleph Project,’’ named after Argentine poet’s Jorge Luis Borges’ concept of the ”Aleph,’’ which means a point in space that contains all the other points. 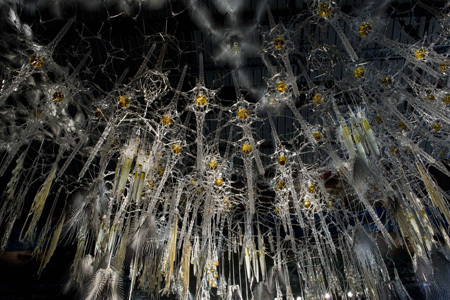 Philip Beesley’s ”Epiphyte Chamber’’ is an interactive installation that needed input from scientists and engineers. It visualizes the nervous system and the intricate structure reacts to the viewer’s movement. “Zeitgeist Korea,” organized by Seoul National University professor Jung Young-mok, is an educational experience. It provides a briefing on the history of Korean modern art. Also interesting is the “Birth of a Museum: Documenting the Construction of MMCA, Seoul” on the second floor. It features works of photographers Noh Sun-tag, and Back Seung-woo, combined with sound artist Yangachi’s documentation of the construction process. Lee, an office worker who visited the museum after work to see Suh’s fabric house on Wednesday, said the MMCA Seoul is beyond her expectation. In addition to Seo’s ”Home within Home within Home within Home within Home,’’ Lee picked Lee Mingwei’s works as her favorite. ”I was wondering what the song was coming from the other side of the museum and excited to find out it was Lee’s work ‘Sonic Blossom.’ It was so special to be presented with music,’’ she said. Established in 1969, the MMCA first nested in a building of Gyeongbok Palace and later moved to Seokjojeon, a Western building in Deoksu Palace. It finally had its own building in 1986 in Gwacheon, Gyeonggi Province, south of Seoul, but due to geographical remoteness from Seoul, the Gwacheon building could drew only some 700,000 visitors a year. 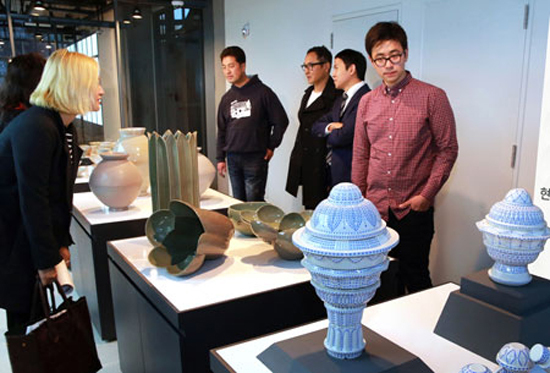 The main inaugural exhibit runs through Feb. 28 Admission is 7,000 won. Online reservation is recommended during November, as the museum limits the number of hourly visitors to 500 due to popular demand. For more information, visit www.mmca.go.kr/eng or call (02) 3701-9500.